Have you ever wondered what it would be like if you were written into a comic book? What would you do if you found a comic book featuring one of your personal heroes? Can a comic book be a way to teach history? On Saturday, May 3rd, the world will be celebrating Free Comic Day. Here at Banting House National Historic Site of Canada, we’re preparing a Spring exhibit which will show you a new side of Major Sir Frederick G. Banting – the comic book hero. Yes, you read that right! Banting was featured in at least three different comics since he discovered insulin in 1921. The first was an 8-page full-colour comic from World Famous Heroes Magazine. It was made in Springfield, MA in 1941, 10 months after Banting’s death, by the Comic Corporation of America. This comic was published in the second issue of the magazine, which only had four issues overall – meaning that this version of the Banting story is quite rare today. Banting also appeared in The Toronto Telegram from 1965-1966, in a series titled “The Giants.” Luckily for our museum, someone clipped this comic out and donated it to us, otherwise we might never have found it. 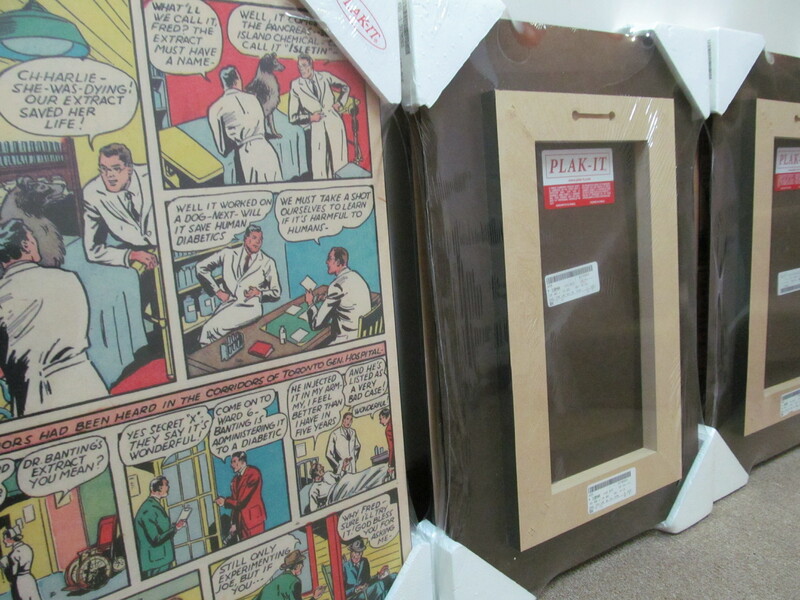 The last of the three comics is Diana Tamblyn‘s black and white The Story of Frederick Banting: Duty Must be Done. Tamblyn is from London, Ontario and published this stand-alone mini-comic in 2002 with critical acclaim. Although it is currently sold out, we’re hoping for another production run so that we can pass this story on to you. The exhibit itself will feature reproductions of all three comics showing their different portrayals of the Banting story, from his childhood in Alliston, Ontario, to the discovery of insulin, to his painting, his death, and his legacy. The original World Famous Heroes Magazine will also be on display. Seeing these comics together is a great way to compare how the portrayal of Banting’s story changes across time. It’s also interesting to see what Banting “myths” are carried on through the comics – for example, the myth he had his idea in a public library (he had it in his bedroom at Banting House). The themes from the comics tie in to the exhibits already established in our museum, but they tell the story in a way that many people have never seen before. So when can you see this exhibit? Right after Free Comic Day, on Sunday May 4th. The official launch is from 2-4pm and includes free admission, a guest appearance by Diana Tamblyn, and reproductions of the World Famous Heroes Magazine available for purchase. We hope you’ll be able to join us in May for this one-of-a-kind event. Whether you consider yourself a comic fan or not, this exhibit is bound to show you something new about our local hero! Posted in Museum Happenings and Events.Tagged artist, Banting, comic, Events, Exhibits, Free Comic Day, graphic novel, History, London, Museums, science.